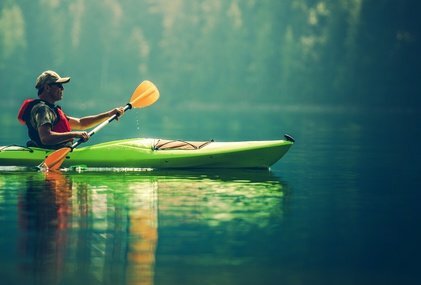 If you love fishing but want to have more freedom for finding the ideal spot than you get by being on the shore, a kayak could be a good solution. The best fishing kayaks offer a stable platform on the water's surface for you to fish from, provide storage so you can take all of your gear with you, and are comfortable so you are able to stay out for as long as you want. In this article we will take a look at the features to watch out for, and provide some fishing kayak reviews to help you make your decision. Communities around the world have been using boats to assist with fishing for generations. By using a light, paddle powered kayak you are able to easily get to tough to reach places in pursuit of that elusive catch. They are easier to maneuver and will get to areas that other boats can’t, and are a much cheaper option than a normal boat. There are lots of different types of kayaks available, but some are more suited to fishing than others. 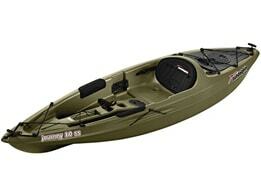 ​The best kayak for fishing will provide you with stability and storage room. Kayaks come in two main types that are either designed for you to sit on top, or sit inside. ​Sit on top kayaks have a molded seat on top of the boat, and are much easier to get in and out of. They tend to be a lot more comfortable because you aren’t contained within the boat and are able to move around and adjust your position a lot more so will be the best beginner fishing kayak. You are sitting on top of the boat, and this offers a lot of storage space for gear alongside you. Bulky boxes or awkward shaped objects will be easier to transport on one of these. As a result of this, though, the center of gravity is higher, which can result in a less stable ride. They are also slower in the water and less responsive than other kayaks. Sit inside kayaks, on the other hand, have you sitting within the boat. They are more difficult to get in and out of, but provide more stability and protection from the environment. With the addition of a spray skirt you will be fully protected from water splashing in, which is especially useful in the cold, but because you are inside the boat there isn’t as much space to store and carry your equipment. The amount of storage space you require will have a significant impact on the type of kayak that you need. Fishing, of course, requires things like rods, bait, tackle bags and even a cooler to keep your catch in, but not all kayaks will be able to carry all of these. Sit on top kayaks have far more space to carry things, but risk the chance of them falling off if not secured properly. Sit inside kayaks don’t offer as much storage room, but anything that you do carry in them will be safer. One option to consider if you are concerned about the overall storage space is that you could get a tandem fishing kayak. This way, you will have plenty of storage room if you’re going out on your own, with just a slight sacrifice of maneuverability. The best fishing kayaks are a balance of both maneuverability and storage capacity. There are two weights that you need to be aware of. The first is that of all the things you will be carrying in the kayak (including yourself). Your kayak will need to be buoyant enough to carry everything, otherwise you will ride too low in the water and find yourself moving slowly and struggling to steer. The weight and size of the kayak must also be thought about, because you will need to store it somewhere, and be able to get it to the water. Will the shape of the boat fit in your garage? Can you carry it on top of your car or will you need a trailer? And will you, on your own, be able to lift it from your car to the water when you’re ready to go out? One solution to this would be to get an inflatable kayak, because they are really lightweight and can be stored in a much smaller space. ​Where do you Plan on Fishing? If you’re going to be in your kayak all day, you need to make sure that you will be comfortable throughout. The key part to this is the seat and the leg room that you have. Most kayaks come with a basic seat that is removable, so it may be worth budgeting for a more comfortable one. If you’re looking for a kayak that comes with a series of features to help you go fishing, then this product from Sun Dolphin is worth your consideration. It is a sit on top kayak with an open cockpit, and offers plenty of space to carry your gear and feel comfortable. 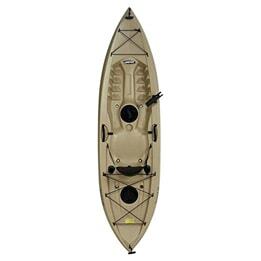 This kayak is perfect for fishing on calm waters, and it has two flush mount rod holders and a swivel rod holder too. As it is a wide design, you will feel stable when you are using it, even if the fish tug hard on the line. This inflatable fishing kayak from Sevylor provides everything that you could need from a kayak when going out on a trip. It’s comfortable for long journeys, stable, lightweight and has lots of storage space. You can even expand its capabilities, depending on your intended uses. 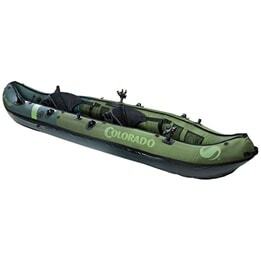 This is an inflatable kayak, so is far easier to store and transport to your chosen location. There’s no need to worry about it’s sturdiness, though, because it has been constructed with multiple air chambers that means it will stay inflated, even if there is a puncture. The double threaded Boston Valve and the Airtight system makes it simple to inflate and deflate, so you’ll be on the water in no time. For a tough, durable kayak, this option from Lifetime is worth looking at. It is designed with room for one person to get out onto the water with plenty of room for all of your fishing accessories, and provides a stable platform for you to work from. The seat and footrest are adjustable to ensure you find a comfortable position within the boat for long periods of time. There are two flush mounted rod holders and a top mount rod holder to give you a variety of ways to mount your rods, and allow you to have multiple lines out at the same time. This kayak also has two 6” storage compartments, one in the rear and the other in the center, for you to keep your equipment and your catch, and the open top design means there’s plenty more space to carry things with you. This kayak from Old Town offers comfort and convenience for your fishing trip. It is made from a tough polyethylene material that has been designed in a way to keep you feeling sturdy and secure on the water. This kayak from Ocean Kayak is one of the best that are available, and definitely justifies the price tag if it’s within your budget. Every aspect of fishing on the water has been taken into account with the design of this kayak, and you’ll have everything you need close to hand. It offers a comfortable ride with a fully customizable Comfort Plus seat. There are 2 rod holders to allow you to fish over either side of the boat, 2 paddle keeps so they won’t get lost, and a performance hull that allows you to travel quickly and quietly through the water, while remaining stable. Storage is impressive in this kayak, with a large front hatch that provides access to the internal storage space that runs the length of the whole thing. You’ll be able to fit a number of rods in here, and there’s also an oversized tank in the rear that can hold things like coolers, tackle boxes, and even scuba tanks. The kayak is also customizable, with extra kits available to add a rudder and further rod holders.